This is probably the most popular Greek dish. Greek Souvlaki is made of pita bread, pork meat, tzatziki, onions and tomatoes. It is easy to prepare, nutritious, absolutely delicious and sold everywhere in Greece. 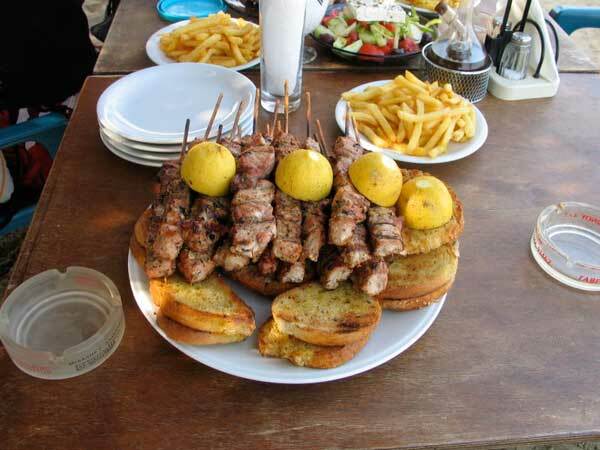 Souvlaki is a fast food served in souvlaki restaurants or "souvlatzidika" as Greeks call them. 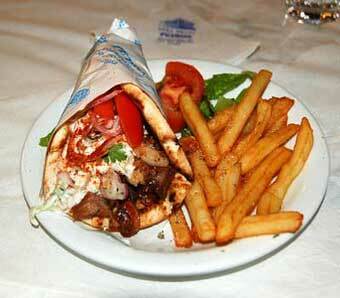 These are small or bigger eateries that also serve gyros and other grilled meat dishes. You can buy one to take away and eat it on the street or sit in and enjoy it as you would do with a normal meal. 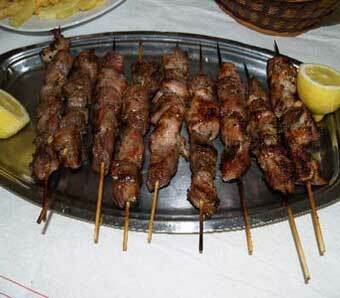 Souvlakia are small cubes of pork threaded on a small wooden skewer, also known as a "kalamaki". Souvlaki is Greek, no dought about that. It first made its appearance in ancient Greece, as proved by a recipe from that time. The dish was called "kandaulos" and combined grilled meat, pita, cheese and dill. Many centuries later street vendors were selling souvlakia with pita in Constantinople, the capital of Byzantium. Today souvlaki is available in souvlaki shops and restaurants in every Greek town and city. You can order it as a takeaway and of course you'll always find it sold at canteens at street markets, on the beach or by the side of the road. 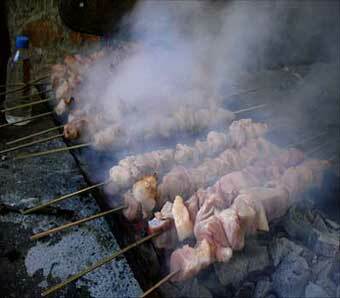 At every festival there's at least one vendor filling the air with the delicious smell of char-grilled souvlaki. 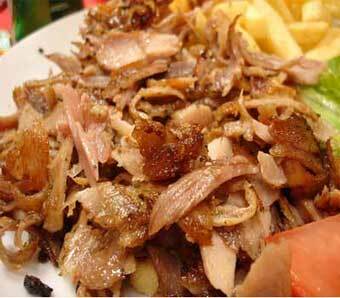 Apart from the classic pork souvlaki, you can also try chicken or any other meat. One shop in Athens even serves ostrich souvlaki. All these variations were invented to provide a different taste, and also contain far less fat and cholesterol than pork. In restaurants (but not souvlaki restaurants) the souvlaki is not the typical Greek souvlaki but it is rather bigger, threaded on a metal skewer and not served inside the pita. There are also swordfish, prawn or vegetable souvlaki. 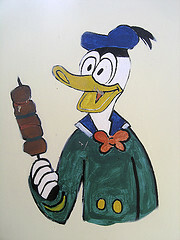 The traditional kebab is also cooked on a spit but it's not called a souvlaki. It's made of lamb or pork mince with spices and looks like a big elongated meat patty. After you buy fresh pork meat you should chop it in small pieces, preferably cubes and marinate it in olive oil, oregano, thyme and a bit of vinegar for 8-10 hours. Then, add some salt and pepper and place the pieces on souvlaki skewers. Be careful not to over-grill the meat. Pita breads are essential to have a genuine Greek souvlaki so grill the pitas and then add some tomato, onion and tzatziki (prepared with yoghurt, garlic, cucumber and olive oil) along with the meat and dinner is served.